So I’m going to take a moment and write about diversity in comic book art and in commercial illustration. As you may have noticed, I haven’t posted a lot of art. The truth is I just haven’t had the heart in it because I wasn’t sure of my skills. I was getting bummed because it feels like I wasn’t progressing as an artist. It’s annoying, and sometimes you just need to take a break. My early-30’s didn’t seem like a good idea to do that, but here I am. I finally sat down to go back at it, but I started to realize something: The reason I wasn’t progressing is because of a lack of diversity in my work. As much as a loaded word “diversity” has become in the commercial art world (comics, illustration, design, movie, cartoons, video games, etc), I think it gets confused, and in this piece I’m going to use a lot of words that you may be used to but I want to be clear on them now before I get into my thoughts. Diversity: noun -the state of being diverse; variety; a range of different things. Representation: noun – Multiculturalism in art displayed by inclusive diversity. o me, “representation” in art is just another way of saying “multicultural”, and that’s an odd way of putting it, isn’t it? For me, I like that word more than “diversity” or “inclusive” because I think it means just representing the world as it is or how you may want to see it. I went to art school from 2002 – 2006. When I got out of school, commercial illustration was in the middle of trying to figure itself out. The digital revolution (yeah, I know, bare with me) had changed everything and it was a mix of old-school tradition mixed with digital art. To me, things calmed down around 2013, and I started to see a new trend in illustration. The thing I had loved was my personal speed and how much fun I had cranking out illustrations and blowing people away. Now people were able to pick up a Wacom and do everything online at an incredible level of quality. This only grew, and I was thrilled to see it! It also freaked me out. Then I was lapped. In the past year I started following newer artists and some of them have absolutely blown me away with both their quality AND how fast they crank out work. 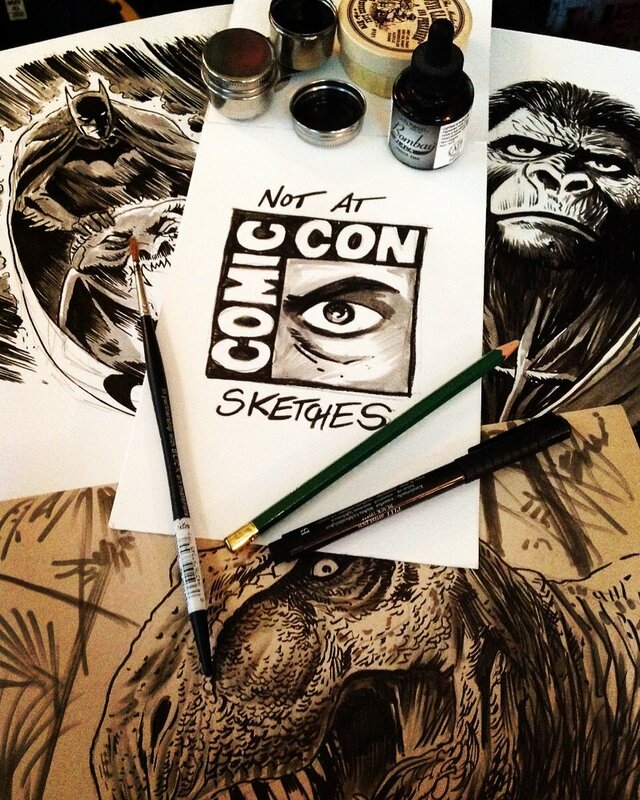 Francesco Francavilla is my personal art hero these days. Funny story: I started following him because I thought he was someone else, but I’m glad I did! His work has been inspiring and has forced me to reconsider my own work, and it humbles me. Also, Terry Dodson is just astonishing! His “in progress” pics always inspire me and they help me reconsider how I approach a piece and ink it. I feel hyped just thinking about it! Francesco Francavilla’s work. This was his desk using brush pens. BRUSH PENS!! 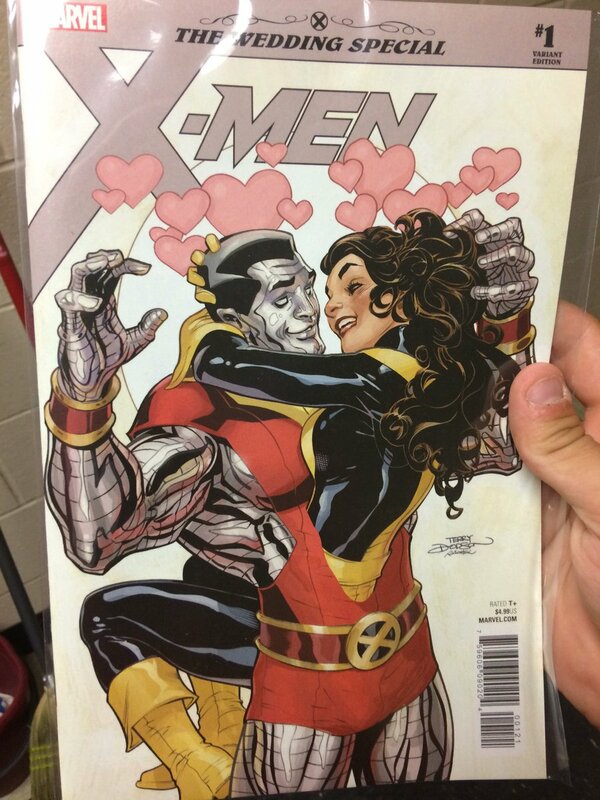 Terry Dodson’s variant cover for the X-Men Wedding Special. His art is just so much fun to look at! Tonight I was taking the train home and trying to sketch out a few ideas like I always do, and then I realized my problem: The lack of diversity in what I draw. I tend to have a set subject matter, and I’m pretty happy with that. I’ve never shied away from that fact. But empty backgrounds only go so far, don’t they? And you can only draw so many pinups until you need something else. And then I thought about the lack of representation in my work, too. I mention all of that because both Francesco and Bengal have both of those in spades! It’s awesome, and without realizing it that’s part of the reason why I enjoy their work so much. You never know what they’ll post next, but you always know it’s their style! Diversity and representation in art really does matter, now more than ever! Not only does our audiences demand it, but they just make art better!